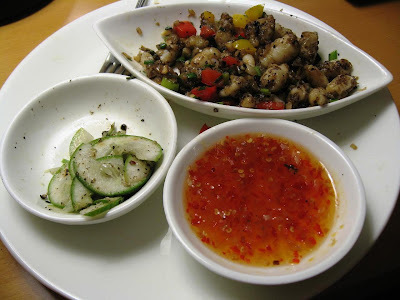 Aah... squid .. that reminds me of the shacks in Goa serving various finger licking dishes of squids and prawns. A non-food post from you in a long time! Nice! 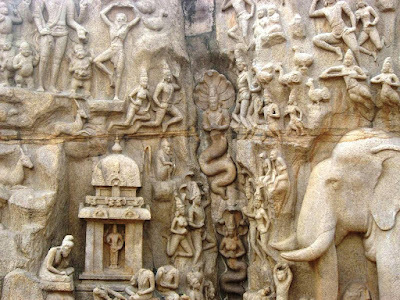 Mahabalipuram has been on my list ever since I was a kid and your post makes my resolve stronger. Some of those carvings are just beautiful. Nice description with very nice photos. I was planning a trip to Mahabalipuram and Puducherry and this will certainly add fuel to my planning! @Aathira: Oh yes, I love the seafood in the shacks on the beach in Goa. @Lakshmi: I guess you would know the history behind this place much better than I do. This was my first trip and I didn't have time to explore the light-house. 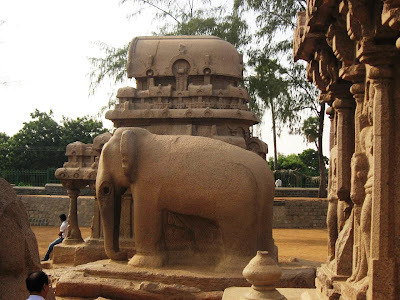 But I did learn a thing or two about the epicurean Pallavas. @Nimesh: Thank you. And do share your experiences from the trip. 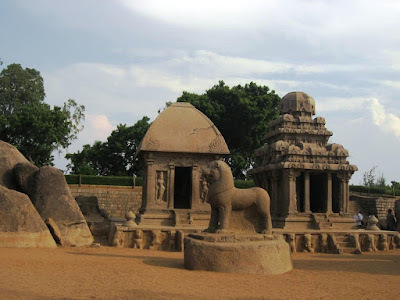 It was a pleasure to take you around Mamallapuram (as Mahabalipuram was known to history). 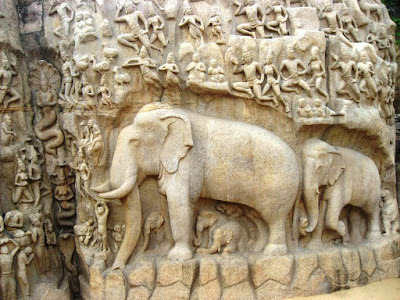 There is a lot more to see at Mahabalipuram. 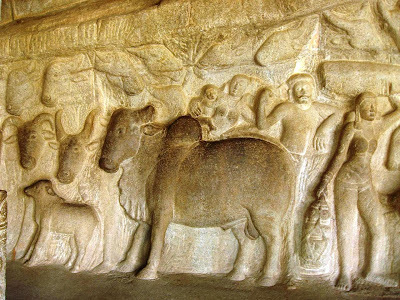 The next time you may want to go to the Tiger Cave area to study the oldest Devnagari inscriptions. 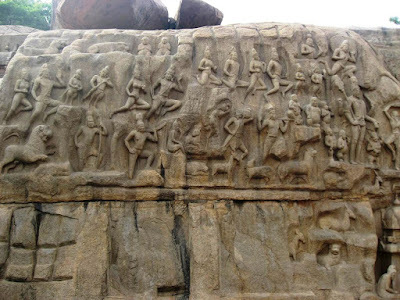 The Pallava Sanskrit inscriptions are gorgeous to look at. 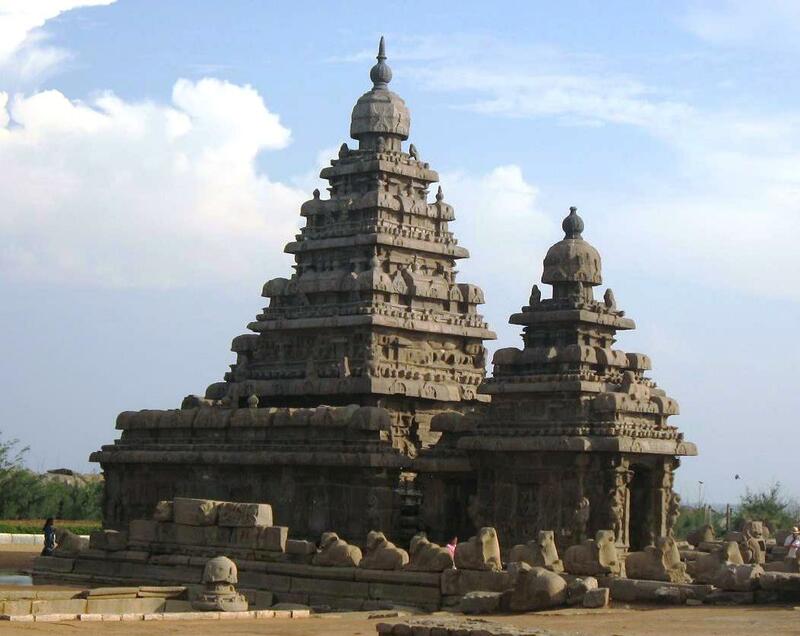 And if you get a chance, you should visit Kanchipuram the ancient city praised by Kalidasa as "nagareshu kanchi." 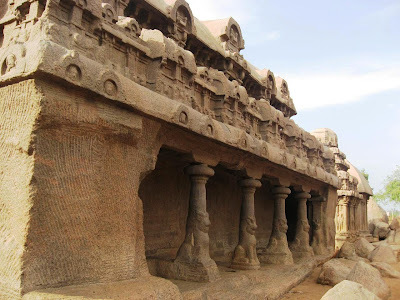 Its Kailasanathar temple is presumed to be the model for the Ellora Kailasanath temple. And oh, nutmegs are from the Maluku islands, the so-called 'Spice Islands' in Eastern Indonesia. @Kyh: Yes, the name escaped me...had read about it in John Keay's wonderful book, The Spice Trail. 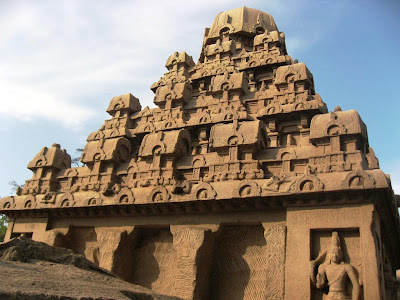 Hello Shantanu, This is indeed a very vivid and picturesque account of Mahabalipuram. Have not been able to visit your blog lately. 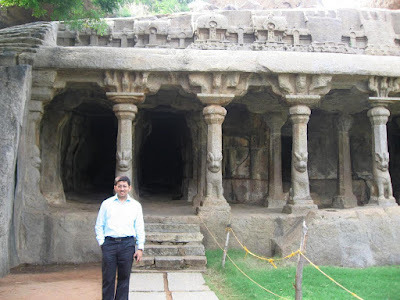 It is very refreshing to read your blog :)Have not been able to meet you ever since I left the company.Do let me know when you come down to Bangalore. Waiting for you at Blogtrotter, which is firmly back to an amazing building... ;)). Enjoy and have a great weekend! 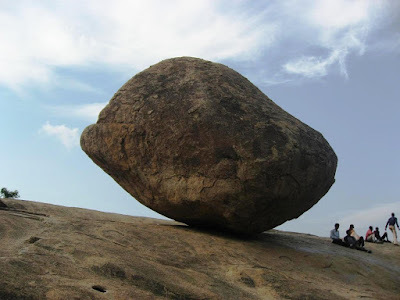 Wonderful picture of the balanced stone. Gives a very nice perspective. 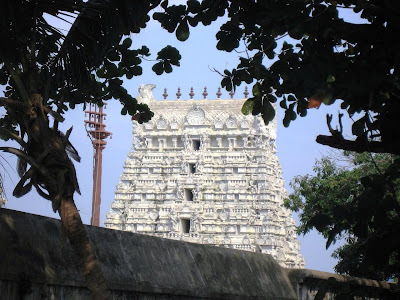 I really liked the shore temple and even a couple of restaurants around the area. Maybe you should give one of them a try the next time. 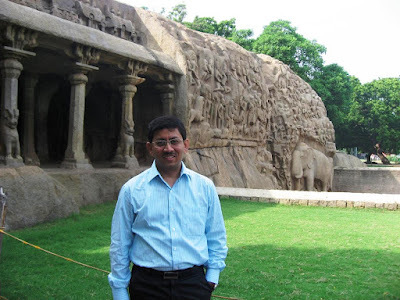 @Karthik: Good to see you here. Thanks. Not sure if I will have the time while in Bangalore (which is where I am right now!). @GMG: I know, I know. I have been tardy in my browsing habits lately. @Sid: Welcome here! Thank you for your comments. 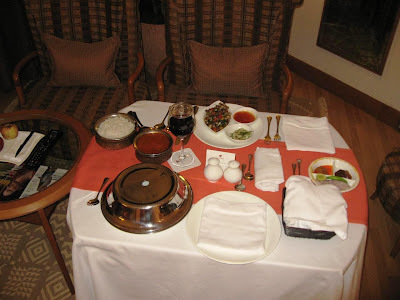 The only restaurant near M'puram I tried was at the Fisherman's Cove. @Anon: Not quite sure what you mean. @Anon: It will be helpful if you can identify yourself and your blog first. 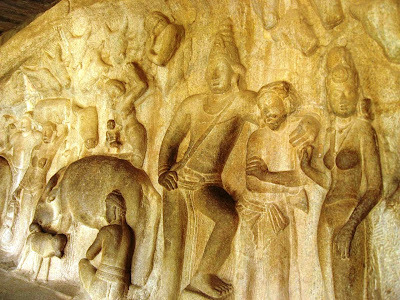 Hi Shantanu, We have just set up a facebook page for love of Mahabalipuram! Please like and share! And let us know if you want to contribute as well and I will provide you admin rights.